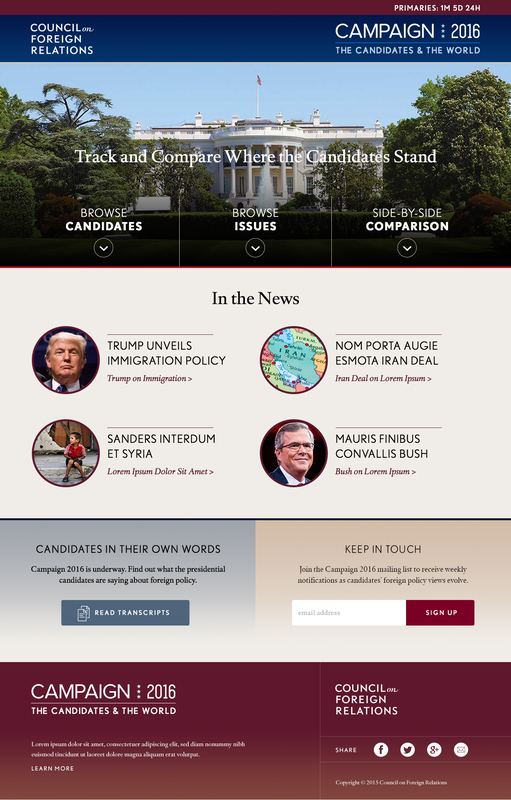 TRACK AND COMPARE THE CANDIDATES’ STANCES ON FOREIGN POLICY. 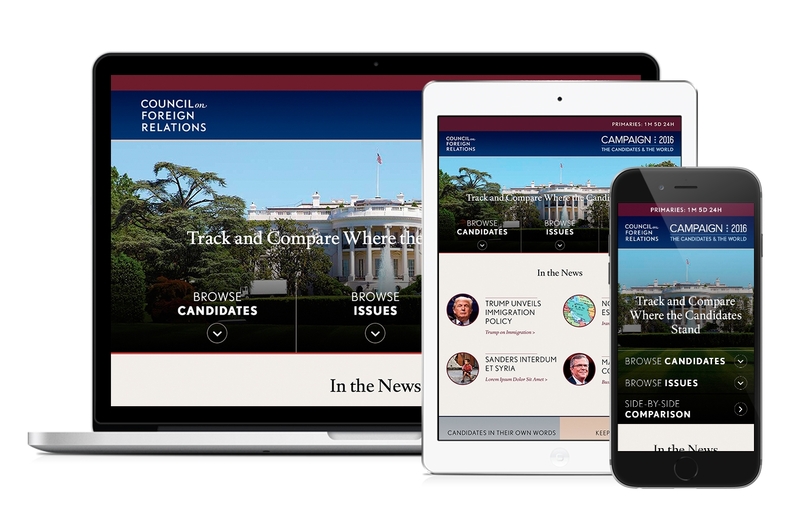 Building upon our ongoing relationship with CFR, we were asked to help conceive and design CFR’s official microsite for the U.S. presidential election. 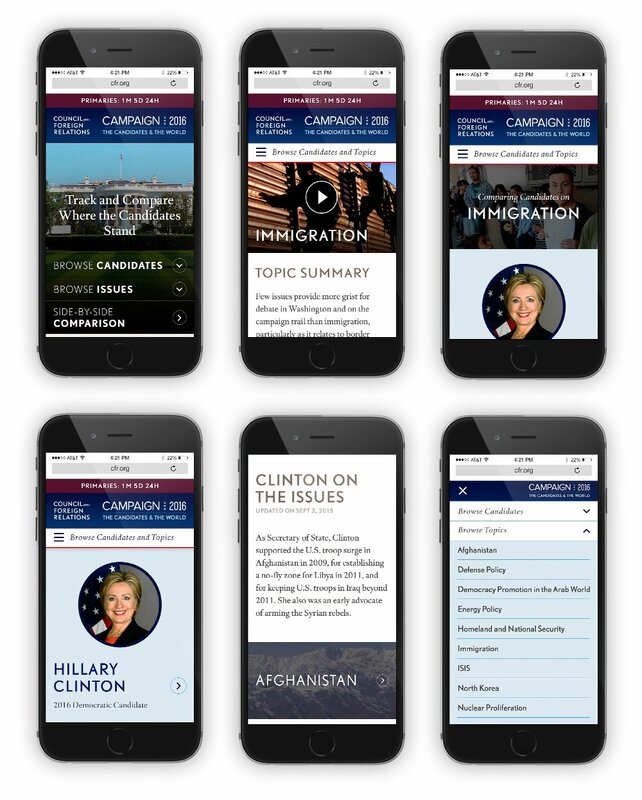 The goal was to create a tool that would allow users to easily track and compare where the candidates stand on a number of foreign policy issues. CFR made clear that although this would be a part of the overall CFR umbrella, they wanted to use this site as an opportunity to branch away from the traditional style sheet to try something more modern and engaging. The result is an award-winning application that glides from issue to issue, candidate to candidate, and stance to stance. Coming into this project, our main goal was to make it easy to shift between candidates and topics, and to quickly be able to compare candidates on those same topics. The site revolves around what we called the “Candidate Topic Detail Page,” or a specific candidate’s stance on a specific topic. 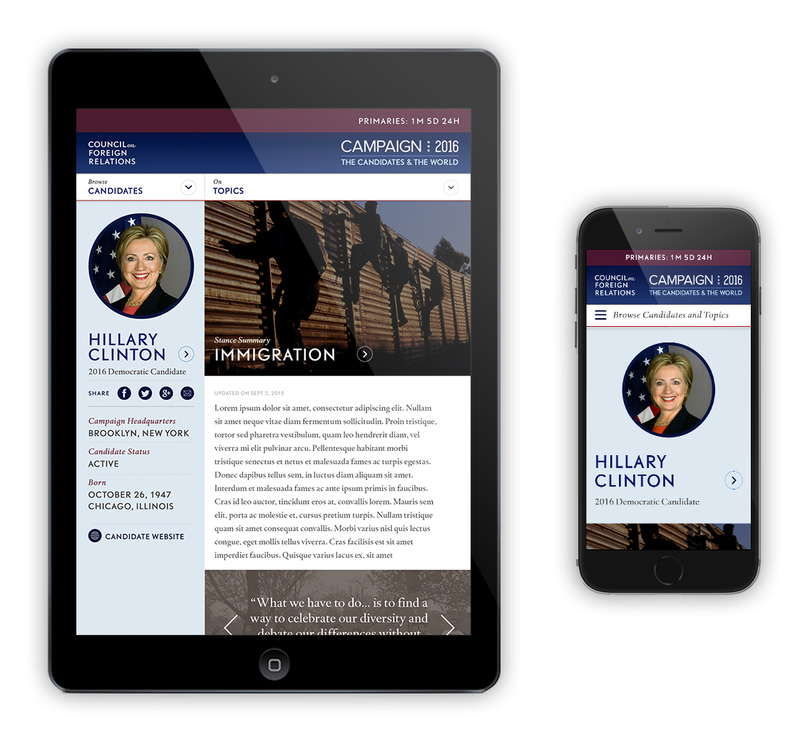 On this page, the user can read about a candidate’s stance in the candidate’s own words. From there, users can choose another candidate stance to view on the same topic, another topic to view for that same candidate, or compare several candidates on the same topic—all from the persistent navigation in the header. Users can also go to a candidate’s page or the topic’s page to learn more about either. On the topic pages, we gave ample space to feature the animations CFR created to give an overview of each topic. And on all the pages of the site we prominently featured CFR’s world-class commentary. Another goal was to make sure that no matter where the user was on the page, they were prompted to compare candidates. At the bottom and top of all the stance pages, there are Calls-to-Action to either switch to another candidate on that same topic or to learn more about the topic being discussed on that specific stance page.